Question: "What's in that tube of J-B Weld epoxy?" This thread is basically another look at the filler material from the resin component of J-B Weld STEEL epoxy, prepared by washing with acetone as I described in the Microscope forum at http://www.photomacrography.net/forum/viewtopic.php?p=172596#172596. Here's the view at highest magnification, in stereo. These are crops from a stack shot at 20X on a Canon T1i with APS-C sensor. 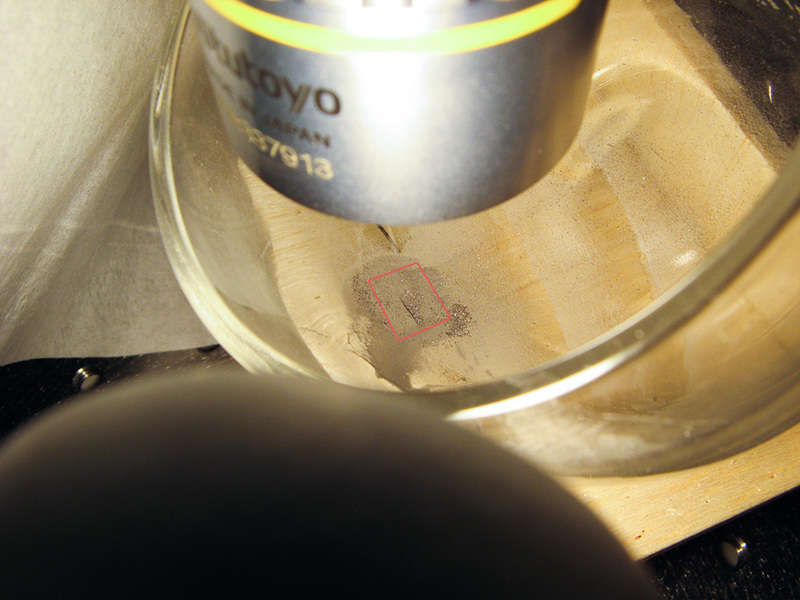 The uncropped frame width is about 1.1 mm; these crops are about 0.3 mm wide. In the crops, especially in stereo, you can see how exquisitely thin some of the red flakes are. Here's the whole frame at 20X, 1.1 mm field width. If you go looking for the crops, be aware that I rotated those 90 degrees so that I could capture more interesting stuff in each vertical-format display. Now we'll work out to lower magnifications, to get more context. In each image, I've outlined the approximate area covered by the previous image. The filler material is lying in the corner of that round-bottomed glass, which in turn is propped at an angle so that a vertical lens can look down somewhat obliquely onto the surface of the material. The trench that we're looking into is where I reached in with forceps to get the sample that turned into the microscope slide linked earlier. Illumination was by Ikea Jansjö LEDs diffused through latex glove fingertips and further diffused by Kleenex tissue around the specimen. Where did all the red bits go? Have they changed colour, or appear to be a different colour, or have they reacted into the cured product. What could they have been if the latter? Pass. I see the word "cresol" in some of the formulations of higher performing epoxies ( with Novolac) and I've heard of cresol red, but that's probably spurious. What are the flakes which look like metal? Alumin(i)um? How to tell -? Dissolve the rest away in methylene chloride? I have sometimes wondered about silver-loaded epoxy resins. They conduct electricity, so enough of the silver particles must be touching throughout the material to present to whatever probes are applied to test with. It strikes me an an interesting problem to produce conduction using the minimum silver (or conducting compound such as a chloride). So what morphology would that suggest? I think it's very fine strands, like cotton wool. Nanotubes or nanofibres. I love the Zerene Stacker stereo views. What are the flakes which look like metal? Those are all the same flakes! It turns out that when dry, those flakes are dark saturated red in transmission and shiny even darker red in reflection. With directional illumination, what you see are dark spots that sparkle when the light hits them correctly. But in very diffuse illumination, you get this metallic appearance. 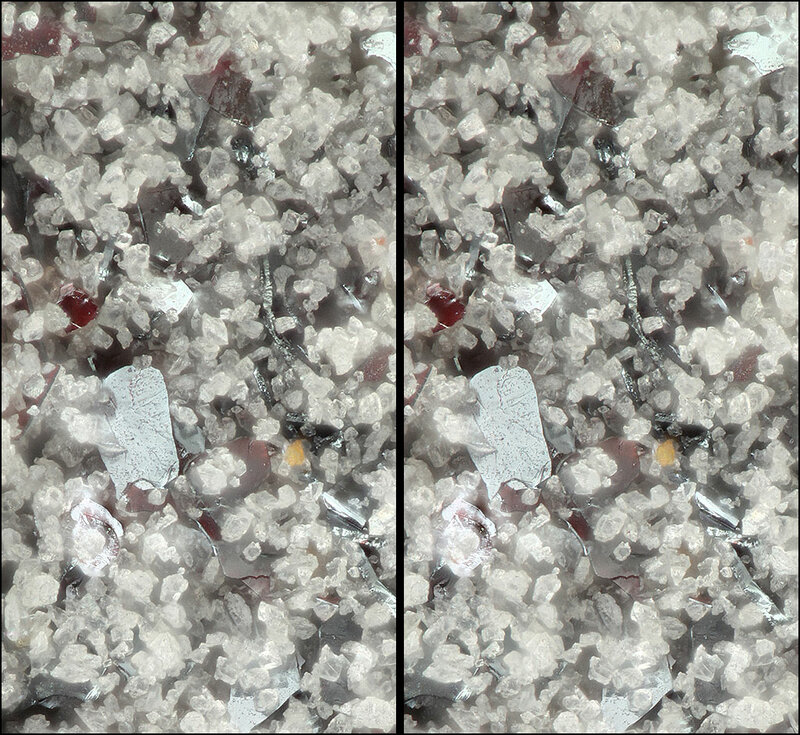 Here is a crop from one of the stereos, showing several "red" flakes in various orientations. They look metallic where they get to reflect the diffuser, but where I've placed the arrow you can see some red light shining through to illuminate a surface that is otherwise oriented to not reflect much of anything. Here's a 100% crop from that overview shot, which has had most of the light tent removed so that one of the Jansjö's with its latex fingertip is shining on the material directly. You can see what I mean about "dark spots that sparkle". JB Weld has iron particles in it. Does iron oxide behave similarly to your red particles? JB Weld has iron particles in it. J-B Weld used to have steel particles in it, according to their old MSDS. The current MSDS no longer says that, and there's no indication that the current product actually does. See the discussion in the microscopy thread, HERE. 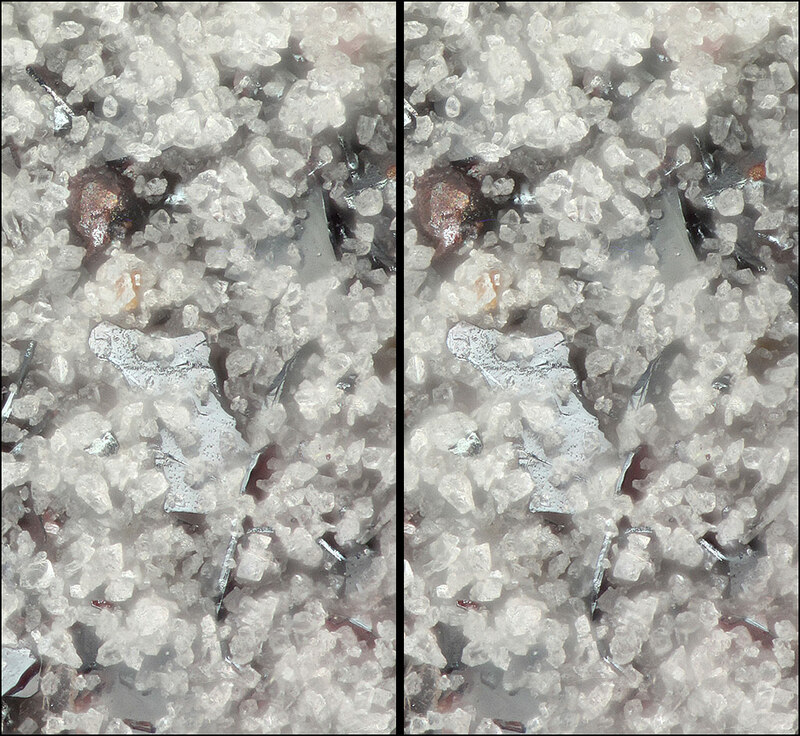 In the topmost stereo pair, there is a "ball" near the top left that looks like iron or steel, complete with surface oxides. It would be interesting to see if it is attracted by a magnet. I've tested small particles for this by placing a fine pin on a rare earth magnet, with the point of the pin protruding, and using the magnet as a handle. It would also be interesting to see how the various particles react to a strong acid. The silicates would not be expected to react; iron would probably oxidize; anything calcareous (not likely to be present) would probably foam. The JB Weld I've purchased recently has a weak attraction to magnets. In the topmost stereo pair, there is a "ball" near the top left that looks like iron or steel, complete with surface oxides. It would be interesting to see if it is attracted by a magnet. I've tested small particles for this by placing a fine pin on a rare earth magnet, with the point of the pin protruding, and using the magnet as a handle. I couldn't get a definite answer to the "ball" question. Certainly it did not come jumping out of the pile at the call of the magnet. On contact with the pin, everything stuck together including the clear crystals. I'm thinking surface moisture or Van de Waals forces. These particles are so small that everything sticks to everything unless they're immersed in liquid. By the time I thought of "immersed in liquid", the little ball-looking thing had gone missing. I haven't seen it again, despite subjecting nearly the whole pile of stuff to various fluids (as described next...). It would also be interesting to see how the various particles react to a strong acid. The silicates would not be expected to react; iron would probably oxidize; anything calcareous (not likely to be present) would probably foam. I treated part of the stuff with a freshly purchased bottle of muriatic acid from the local hardware store, "Active Ingredient: HYDROGEN CHLORIDE . . . 31.45%". 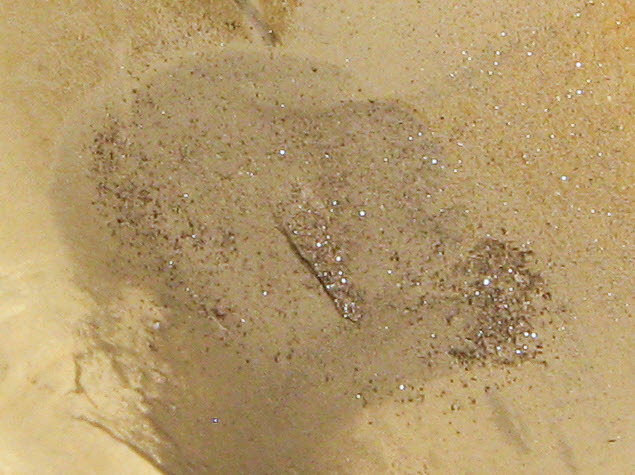 The powder foamed furiously for a couple of seconds, then settled down showing still some clear crystals and the red flakes. It's now about an hour later and neither of those shows any sign of dissolving. I treated another part of the stuff with liquid Lime Away, exact composition unknown, but the active ingredient for rust & scale is sulfamic acid. Results were similar to the other acid. In the HCl, some of the red flakes got stuck floating on the surface. I used that as an opportunity to look at how magnetic they are, compared to some iron powder that I floated on the surface of water in another container. The answer is a lot less, like maybe 100 times less. With the magnet I was using, and a roughly 2" diameter container with 3 mm thick walls, iron filings in the center of the container would rapidly orient and migrate to the edge in a few seconds as the magnet approached, forming a raft that the magnet could easily draw around the container. With the red flakes, only the ones within a few mm of the edge would orient in a few seconds and even those would take a long time (many seconds to minutes) to migrate to the edge, where they formed a loose aggregation that the magnet could not draw around the container. The comparison looked a lot like that shown at https://www.youtube.com/watch?v=rTR-Mm_lQA4 for steel versus Fe2O3. 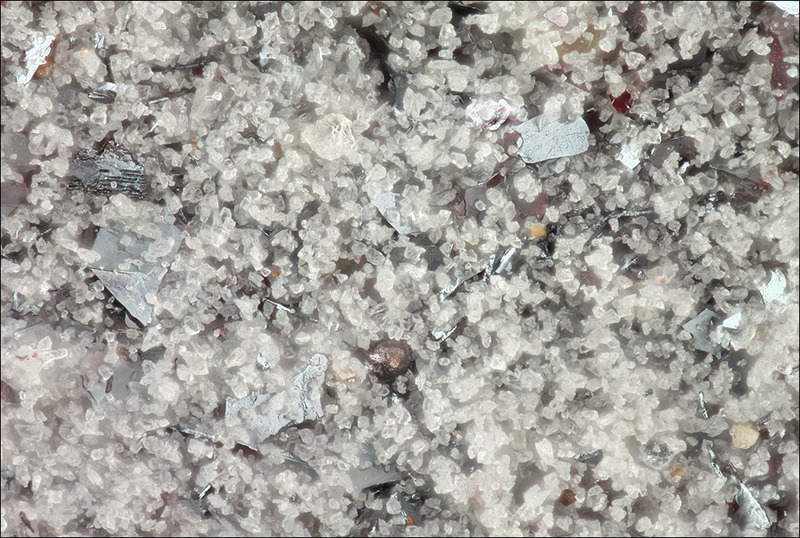 Edit: corrected typo, "power" --> "powder"
I still believe that those metal looking flakes are Hematite, at least they behave as such. 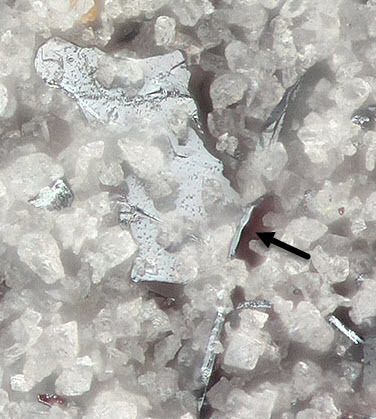 This mineral is mostly opaque with a metallic luster under reflected light, but thin enough flakes are red colored under transmitted light. Looking at a few references it seems that hydrochloric acid may not be the quickest acid to dissolve hematite, but if left it should all go eventually. That's been my personal experience descaling rust from inside stainless heat exchangers, where there are often red rust deposits (though more is magnetite). My usual elixir was the 30ish% HCl diluted to about half strength so it fumes less, and given 10 minutes with boiling water in the other side of the heat exchanger. A second treatment, after the first is emptied, usually gives almost no further fizz and the stainless steel is silver-shiny. Strong magnets left in heating systems usually come out black, (magnetite) but I have seen red too, depending how well the water was oygenated. I can find a reference or two for the mineral being transparent or "subtranslucent", but not the chemical compound. Perhaps JB use powdered rock which just happens to have some iron atoms in it. I do not think that magnetite can be formed in the low temperatures of a heating system. This mineral is common in igneous and metamorphic rocks, thus needing a range of pressure and temperature that can not be attained inside our normal appliances. Some iron minerals formed at surface or near surface conditions are goethite and limonite, but even these might be difficult to form inside a heater. If you used a neodymium magnet, they are strong enough as to attract just about any material containing small amounts of iron. I like the use of the latex fingertips vs. tissue paper on the actual LED lamps themselves. Major fire hazard avoided! I do not think that magnetite can be formed in the low temperatures of a heating system. It's the commonly accepted form, due to the lack of free oxygen. If a sytem has an air-ingress problem, then you get the higher oxygen content forms (haematite). It's strongly magnetic, enough that an accumulation is easy to find with a magnet, through a copper pipe.